Portable Air con can be provided at an extra cost of 25 euro per unit per week. Pool heating is £70per week if required. All on one level, the interior of this home is very welcoming; the main living space opens up to the pool area and features plenty of comfortable seating; In the garden is a new Canarian brick BBQ, sit back with a glass of wine and admire the wonderful and most fantastic views of Montana Roja and views of Fuerteventura. Relax and appreciate the tranquillity of island life from the newly landscaped gardens. The kitchen is fully equipped, —it features large and small appliances like a dishwasher, washing machine, microwave, kettle and coffee machine. The channels available on the TV are English, Italian, Deutschland and Austrian. There is also a music centre with radio and Bluetooth. The villa’s stylish bedrooms deliver everything you need for restful nights sleep. There are 2 king-size bedrooms and 1 twin. A 25 minute walk from the property brings you into the Marina, known for its designer boutiques, restaurants, cocktail bars and stunning views . On a Wednesday and Saturday the market is held here, the stalls offer unique products . From here, you’ll be close to beaches where you can enjoy a bounty of activities from snorkelling to fishing and sailing or simply just taking in some sun on the sand. 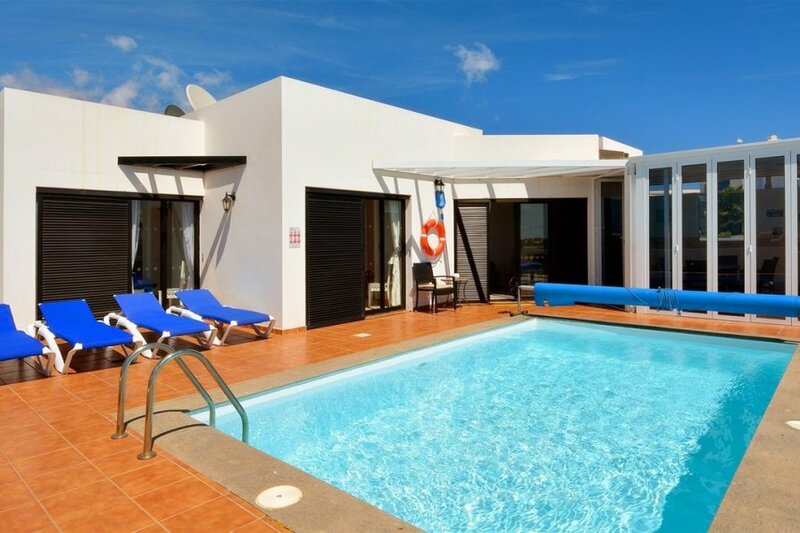 Early booking is advisable for this villa. The White Room - King-size bed with built in wardrobes and patio doors that lead out to the pool area. The Blue Room - King-size bed with built in wardrobe, this bedrooms also leads out to the pool area. This bedroom has an en-suite. The Silver Room - A lovely twin bedroom which has 3 windows, so plenty of light. This bedroom has a free standing wardrobe. Separate bathroom with bath and shower over, bidet, and WC. Pool heating is available if required at £70 per week.